I was agonizing in front of my closet this morning when I looked up and caught a glimpse of a pretty robin's egg blue, like a little Tiffany's box up on the highest shelf. 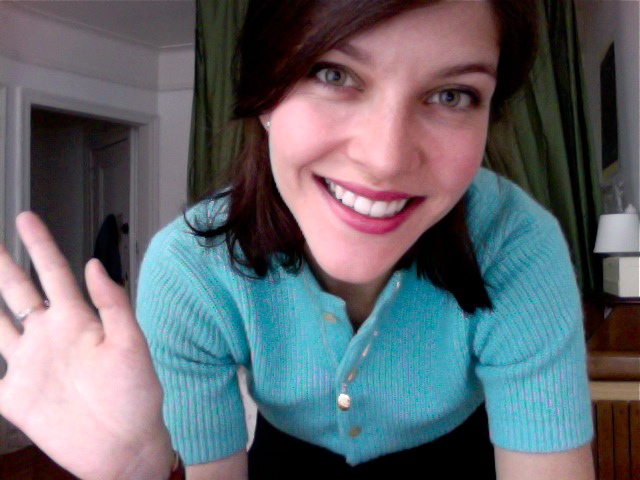 I've had this little vintage sweater for years, but don't wear it nearly enough. I'm such a sucker for a short sleeved sweater, especially one with ribbon details. Oh! 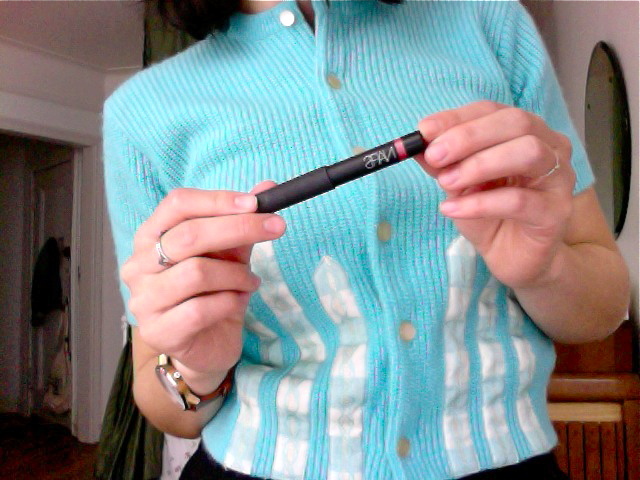 And I wore this pretty lip pencil from Nars, I got it for free from Sephora which is pretty rad. Its called New Lover and is like summery shimmery pink. 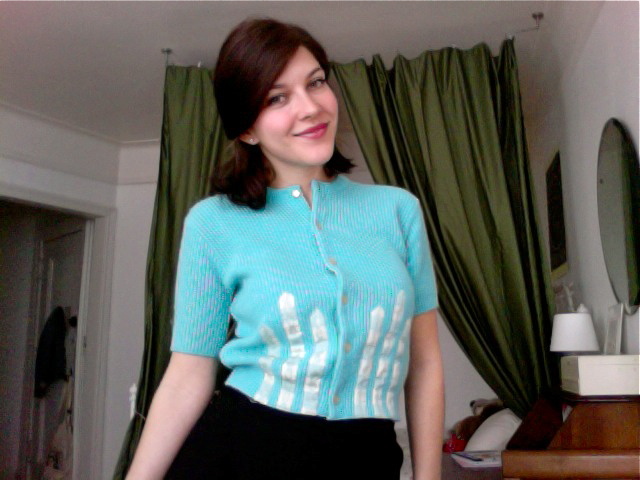 Short sleeved vintage sweaters are the best! This one is so pretty on you! So good for whatever Spring throws at you! Aaah, that sweater is so pretty and unique! I wear short-sleeved sweaters all the time too. 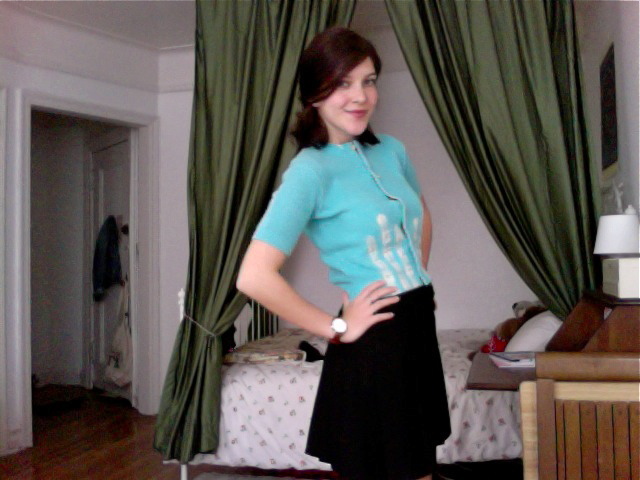 No bust gapping like with shirts, but they still look pulled together. And they usually have nice details. HOW DID YOU GET IT FOR FREE. *runs to Sephora, demands free stuff* No but seriously why are you always so pretty, stop it. That sweater is amazing. As are you. Join that points program and then spend ALL yo moneyz there...then wait til they actually have a good giveaway and POUNCE. Also, you're really pretty too!! So shush. I had to check out of all things media/social life for awhile bc work is crazy but there is snail mail headed your way! On days when I don't post, I often find myself in an array of black too. Its hard to break out of!